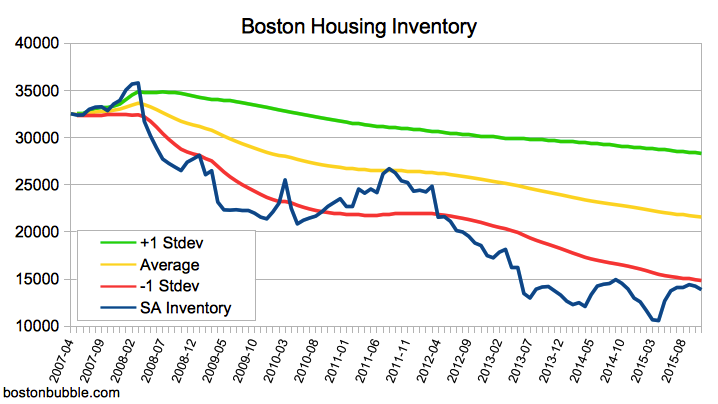 As an attempt at working out a way to better monitor inventory so that a change in the trend can be spotted more easily, I've converted Zillow's inventory data for the Boston MSA into a seasonally adjusted series. The conversion is simplistic, and if there are suggestions for improvements, please post them. For each month, I adjusted the raw inventory number by the percentage of inventory that the same month represented in all prior years. I extended the data series back beyond the beginning of Zillow's data by using the older Boston inventory data from The Department of Numbers. Below is a graph of the results from April 2007 - November 2015. One looming question this raises is: where is the inventory from baby boomers? Eventually, their exit will likely create a boom on the supply side as they retire, downsize, and move on. Previously, this was projected to begin in 2015 and to easily take two decades to play out. This is a major risk factor for current buyers because the inventory hasn't materialized yet, may not materialize soon enough to help buying in a practical sense, and yet when they want/need to resell their home, they could very well be competing with much higher inventory.